First impressions can be lasting as far as business is concerned, particularly with potential customers. Future interactions with potential customers can depend of the first contact made with them. Having a shiny, clean floor can be critical, although this doesn’t seem like one of the critical aspects of a business. A shiny, clean floor shows your willingness to go the extra mile and your attention to detail. It shows any potential customers that the business they are dealing with have high standards of excellence and quality even for their floors and are very professional. 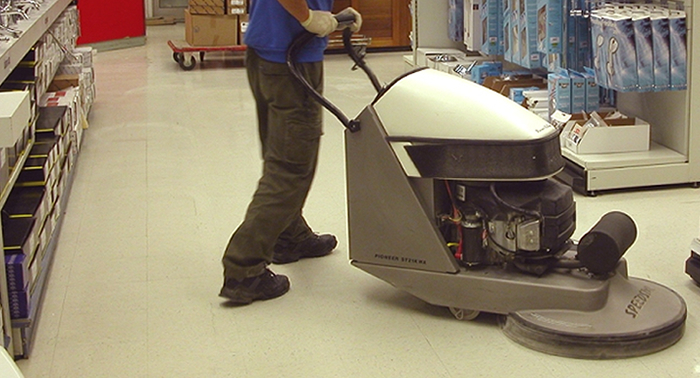 At Crest Cleaning Services, our Seattle Commercial Floor Buffing service takes shiny, clean floors very seriously. However, the majority of businesses simply don’t have the staff or the time required to make sure that their floors are shiny and Usually, any additional available time is invested in nurturing, growing, and supporting the business in addition to the time that staff is working within the business. That is where Crest Cleaning Services’ Seattle Commercial Floor Buffing service comes in. Our commercial cleaning service crews can shine and buff your floor in the Puget Sound area so that when your potential customers walk through your office spaces they will see a bright and shiny floor allowing you to focus on securing their business. We also provide free, no obligation quotes. A floor machine has the general appearance of a vacuum cleaner but is actually a rotary scrubbing machine that functions something like a sander. The machine is slowly pushed back and forth across the floor by a user by controlling the handle. There is an element that rotates at a speed of more than 1,000 RPMs on the underside of the floor machine. Polishing and cleaning pads that shine and buff the floor are attached and can be removed from the rotating element later. A floor machine is a very useful tool for all commercial cleaning services. Our floor cleaning crews are highly skilled professionals in all aspects of commercial cleaning services. Our service starts with us dusting and sweeping your floor to remove any loose dust and dirt. Once the floor has been swept, we will mop the floor, if required, and, prior to cleaning, allow it to dry. Then, based on the kind of floor that your business has, we will select the proper cleaning solution and pad. There is a difference between tile, hardwood, and linoleum floors. We will select the pad and cleaning solution that is ideal for your floor. Then we liberally apply a mixture of water and cleaning solution to your floor and start cleaning the floor by moving the machine back and forth across your floor. After your entire floor has been cleaned, we will repeat this process as required on any areas that still require additional cleaning. These cleaning pads will be replaced whenever they become worn out or dirty. After your floor has been cleaned, we will mop and dust it in order to remove any dirty solution that remains. A wet vacuum will be used, as required, to clean up the dirty cleaning solution when additional amounts of it were used on your floors. A polishing pad will be used on the machine in order to create a shiny, bright surface. In addition, the wax can be stripped and reapplied if you desire. However, this wax is rather durable and isn’t required to be stripped reapplied every time the floor is buffed. The normal timeframe for the wax to be stripped and reapplied is between six months and one year depending on the amount of traffic endured. Crest Cleaning Services’ Commercial Seattle Floor Buffing service can perform complete buffing, waxing, sealing, and stripping, for all kinds of hard surface floors in the Puget Sound area. Hard surface floors require proper maintenance to preserve their luster and resilience, even though they can be extremely durable. We can provide a custom commercial floor maintenance program for your unique flooring to keep it looking like new. Grit and dirt always seem to find their way to high traffic areas. This grit and dirt can result in nicks and scratches and can permanently damage your flooring leaving it looking less than beautiful. We can remove the old finish and sealer from your flooring and reseal it with an all in one, high quality sealer and finish and buff the surface of your flooring to a deep shine. This glossy finish and sealer will reduce scratches and scuff marks on your flooring, guard against abrasion and soil penetration, and extend the life of your flooring. At Crest Cleaning Services, our Seattle Commercial Floor Buffing service offers commercial grade waxes, superior floor care techniques, and floor cleaning methods that will exceed your high standards of flooring appearance and cleanliness. Depending on the texture and kind of flooring in your commercial organization, at Crest Cleaning Services, our Seattle Commercial Floor Buffing service can provide many different floor cleaning and care services in the Puget Sound area. Our floor cleaning and flooring care services include annual, quarterly, monthly, or weekly programs; hard surface floor cleaning; stripping, waxing, and buffing; and tile floor care. We clean many different kinds of commercial facilities and offer customized floor care to meet your requirements in the Puget Sound area.